Been awhile since I dipped into the 1970's and figured may as well do so with DC's Kung-Fu Fighter himself, Richard Dragon. Now, just who in the hell is Richard Dragon? I only have a passing knowledge of Rich, as around the turn of the century... if I'm not mistaken, it was revealed that Richard Dragon (Kung-Fu Fighter) was responsible for training many of the DC Universes heaviest hitters... including Batman, Nightwing, Huntress, and Barbara Gordon (as Oracle!). Back in the 1970's Denny O'Neil and Jim Berry (under the shared pseudonym of Jim Dennis) created this fella for the novel Dragon's Fists. Perhaps a sign of the times, their character made his way into the DC Universe... I'm not sure if he was before or after Shang-Chi (who is not only a Kung-Fu Fighter... but has possession of the Deadly Hands of Kung-Fu), as Shang first appeared in 1973... at which point, I would assume that the Jim Dennis novel would have been at the very least in the planning stages. I suppose, ultimately it doesn't matter... let's see him take on the Weapon Masters in this O'Neil/Kirby kollaboration! We open as a battle rages on in a New York City pawn shop. Richard Dragon (Kung-Fu Fighter) is embroiled in hand to hand combat with... well, the Combatants (that's easy!) to rescue the lovely Carolyn Wotami. Dragon's successful in distracting the goons long enought for Wotami to get away. The entire scene looks like something out of the Kung-Fu Nintendo game... and that's not a bad thing. Outside, Wotami runs away... straight into the waiting arms of Doctor Octo... err, The Swiss... the man who pulls all the strings (for the Combatants, anyway). He grabs her, and drops a mention of a "laser frequency" she knows about. Wotami struggles, and manages to take a bite out of The Swiss... she gets away long enough to rattle off a call for help, that the nearby Richard Dragon (Kung-Fu Fighter) manages to hear. Dragon charges in the direction of The Swissmobile, where The Swiss is dragging the young Ms. Wotami. We shift from Kung-Fu to Double Dragon, as Rich is attacked by some nameless mooks on the street. The geeks claim to be disciples of the Wan Chang style. A quick Google search identifies "Wan Chang" as a style of fine writing... so, Richard Dragon (Kung-Fu Fighter) had better watch his penmanship. How does Richard Dragon (Kung-Fu Fighter) get tripped up? What's next, a low-bridge? Dragon, no slouch himself, engages the gentleman using the forms of Judo and Aikido. He flips the geeks, and utilizes a nerve pinch to put 'em outta commission. Sadly, he is too late to rescue Wotami, and nearly gets hit by the runaway Swissmobile. After collecting himself, Richard Dragon (Ku... okay, I'm gonna stop that now) returns home to his ghetto mansion (seriously). He meets with his best friend, Ben... who is currently hobbling about on crutches, no doubt the result of an earlier adventure. Ben hands his buddy a letter that had been hand-delivered... which kinda puts the kibosh on the super secret ghetto mansion base, don't it? Anyhoo, the letter is written with a German accent, in which Rich is referred to as Herr Dragon.. it is a challenge to battle! P.S. I know where you live! Our Kung-Fu Fighter excuses himself and heads to a tiny room at the top of the mansion. Inside there are several ancient eastern artifacts, including a tiny jade claw on a chain. This is the titular Dragon's Claw, given to him by his Master O-Sensei (which just so happens to be my favorite Journey song)... and it will serve as Richard Dragon's protection charm during the upcoming rumble. We shift scenes to the abandoned Thunder Rock Winery in upstate New York. Inside, The Swiss has assembled the Weapon Masters, and placed a lofty price on Herr Dragon's head. Each Weapon Master is... the master of a different weapon. Among the crew is a lone cameraman meant to get the entire event on film. Richard Dragon arrives on the scene to once again rescue Ms. Wotami. The Swiss lays out the rules of the game. He may have her, if he can defeat the Weapon Masters... unbeknownst to Dragon, even if he does come out victorious, The Swiss has rigged some explosive barrels as a contingency. The next several pages feature a very entertaining, and well-choreographed fight scene in which Richard takes care of all but one of the Weapon Masters... and is left standing before the one who wields a chained weapon... with both a scythe and a spiked mace. Dragon lets his guard down at the wrong moment, and winds up having his left arm smashed. Dragon takes this opportunity to change up his fighting strategy... rather than be on the offensive, he will now use his opponents momentum against him. The foe swings wildly, while Richard swiftly dodges... the battle rages and knocks the poor cameraman off a ladder, leaving him to fall directly onto the blade of a scythe. With victory within his grasp, Richard sets his sights on The Swiss. The Swiss, true to his earlier threat, ignites the explosives and blows the winery sky high. Our hero is able to escape the wreckage, only to find that The Swiss has once again made off with the lovely Ms. Wotami. Well, that was certainly something. Such a weird comic... I'm really not sure what I thought about it, though I can say I enjoyed reading it. Whether or not that means it's any good... I dunno. The dialogue comes across as pretty stilted... definitely doesn't feel like a Denny O'Neil script. It's almost as though we're reading a foreign kung-fu film that had been dubbed in English... poorly, like for 70's movie authenticity. Lines like "Begin... Oh, Yes, Yes... Do!" strike me as being purposefully awkward as though it was only said in attempt at syncing with a foreign actor's lips. I'm pretty sure this is all in my head... but, it's a fun way to look at it! On to the art... it's always a treat to see Jack Kirby's work in a non-reprint format. That said, there's definitely something... off... about many of the faces in this issue. Granted, the King's got his face-types, and I get that they're not for everybody... but, this issue feels different. Everybody has a "mook" face... and the character The Swiss goes from normal dude to mole person from panel to panel. Worth tracking down? Nahhh... it's fun, and weird... and that's good enough for me. I get the feeling this one doesn't cast too wide a net over a frothing fandom, though... I like weird novelty comics, and also understand why others may not. 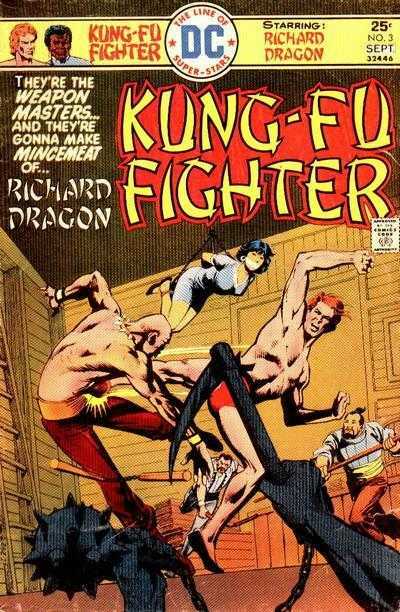 If kooky 1970's comics are your thing, than there's no reason why Richard Dragon, Kung-Fu Fighter shouldn't be part of your well-balanced comics diet. Terrifying... Look at those eyes! I think I have a few of Dixon's 2006 revamp of the character in the Crapbox. Nothing that compares to that Kirby stuff you've got there. Wrap that baby in plastic. I'm pretty sure my introduction to the character was through the Dixon run as well! Never knew the book he originated in had such an awesome-70's name... Richard Dragon Kung-Fu Fighter!!! It sounds so weird! Ya know, I TOTALLY neglected the Kung-Fu TV series when discussing this! I was more thinking of the Bruce Lee films... but I'll bet you're right! It's always a treat when you come across some original Kirby work in the wild. There were a few more issues of this in the darkest recesses of my local shop's "dollar room"... I may have to pop back in and snag'em if they're still there!